I don't have much experience welding, I've done just a tiny bit of stick and a lot of propane soldering. I've got a huge sheet of 1/4" thick structural steel about 57 inches wide by 19 feet long that I am thinking about cutting up into tractor wheel weight disks. I don't have a complete welding rig, but I do have gas welding torches and regulators, just no gas cylinders. When we moved my elderly father up here the movers wouldn't move the bottles, even empty, so he gave them to a friend but brought the rest of his rig. I guess Oxy/Acetylene would be about the best way to cut that steel up? Short of a plasma rig that is ($$$). Would it cost me a fortune in gas to cut that steel into about forty-eight 16" disks? By my rough estimate, that is about 340 pounds per wheel! in a fat 6" stack. Some of those plates would have to have a small cutout for the valve stem. Maybe it would pay to cut it up into more manageable pieces and then hire someone to cut it for me? Including some 4" flanges here and there, this chunk of steel should weight over 1000 pounds. The previous owner of the property left it here and it hasn't moved much since we moved in. It would actually be good to put it to use and get rid of it. I can't see doing it with a sawzall? Any other ideas? Plasma doesn't work too well on old rust coated steel, acetylene and oxygen are getting high priced plus you're talking about an immense amount of cleanup with a hand grinder to make all those discs fit. And to complicate things more than likely the discs you cut out are going to heat warp with acetylene. I really don't want to be a gloom and doomer about your project but why not just buy a set of weights, I think you'll spend less in the end. Frank. We have an O-Max waterjet cutting machine at our shop. They are out of Kent, WA. Maybe you can locate a machine in your area. There are several machine manufacturers in the US. We can cut shapes or designs up to several inches thick in steel. It don't care if it is rusty or not. You can cut glass and almost anything. You get clean crisp cuts with accuracy. You may find a local fabrication/welding shop in your area who might "trade" or partially trade your big sheet for the discs you need. There is some value to a 1000# sheet of steel, even if it is old and rusty. Call around. I'd look at all the previous suggestions and go with the best cost solution. I wouldn't cut it yourself. Your time isn't worth it. But there should be machine shops in the area with a water jet or laser cutter. Those are programable with the shape and can cut a pattern out much faster and with less cleanup than you could do. They may have some interest in the left over steel. Prices have gotten out of whack over the last year for steel and scrap steel. Check with a local scrap metal buyer, they may pay you enough for your sheet to make going out and buying a set of weights acost effective solution. I should have said in the first posting, this steel isn't rusted at all! It has some sort of a dull smooth brick read coating (not rust) like a rust inhibiting paint dip, or some other coating? I'd be happy to find someone to cut it for me. What would a shop with water jet or something charge to cut it into 48 16" disks? I can do the rest of the drilling easily enough. I admit I am cheap, but six hundred pounds of wheel weights costs almost enough to buy a used plasma cutter! This sheet is free. I can write off my time as training. But I don't want to be completely stupid about being penny-wise, pound foolish. So an oxy/acetylene cutting torch would cut it, but leave too much flash around the cut that would require grinding off.... Can somebody swag estimate the cost in fuel? I've got a small local steel yard I could try to sell/swap it to, but he'd still have to come get it, I don't have any way to haul it to him. I still like the idea of a bunch of easy to handle 14 lb weights from free steel... It's just a problem of "removing the little bit of steel that is keeping that sheet from being a bunch of disks." The scrap left over would be about 400 pounds by my estimate. 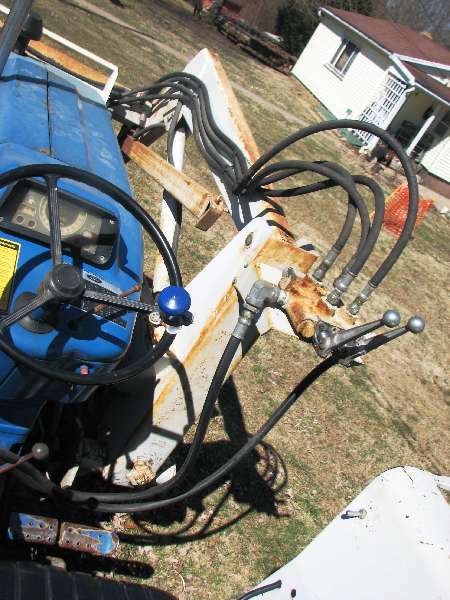 I would actually like to keep the scrap for welding into other tractor implement projects. Part of the scrap would be some long straight pieces with a rolled edge. Like 1/4" thick angle stock with 4" and 1"-2" flanges. I'd be careful with some rust inhibitor style coating. You could end up sick as hell from the fumes using a torch or plasma. Waterjet wouldn't put out any fumes. A 16" diameter disk has about 50" around the periphery. It would take about 2.3 minutes to cut one having a finish just slightly better than a plasma cut. A nicer finish like machined would be 5 minutes. Most shops are selling machine time at about $125.00/hr. The mounting holes can also be cut at the same time which would add some to the total. Hope this gives you a basic idea. P.S. Someone that I know spent a weekend tearing down an old house and burning the pieces. By the end of the weekend he was dizzy and finally collapsed. He was in intensive care for a week and the hospital staff thought he would die. He got poisoned by the fumes and it took them a week to detox him. What is price steel going for per pound these days? I guess recycle value, and cost contribution to new fabrication are two different numbers. sounds like waterjet cutting for just the disks would cost ~$230, a lot less than tractor weight prices for 680#! On the other hand (fumes, etc.) I don't know anyone close by that has waterjet rig, and there's still the problem of hauling it there. I can manage to get good ventilation doing it outdoors. Harbor freight has a plasma cutter for $800 that ought to do the job. Pay half the cost of the plasma cutter in one job! 35 amps, says it will do 3/8" steel. Is it junk? Go to www.yahoo.com. The click on "Yellow Pages" and then change the location (upper right) to Newberg, Oregon. Search under "Machine Shop." You'll have to do some calling or further internet searching, but they have a list at least 10 long in Newberg, alone. Metalworking is another search option. Or Metal Industries Shops. I put a link below to a list of machine shops in Oregon.